Clemson and Duke will square off for the first time under the lights of Wallace Wade Stadium. While the Tigers need a little bit of help to make it back to Charlotte for the ACC Championship Game, the Blue Devils are right in the mix for a Coastal Division Championship. The Tigers have an outside shot at playing in a BCS Bowl and need to win their remaining games in a convincing fashion. Let’s take a look at who has the best chance to get the win. WHY DUKE MIGHT WIN: Duke head coach David Cutcliffe has done a tremendous job in turning the Blue Devils football program around. If Duke can keep him long enough, they may become a long-term contender in an ever-changing ACC Coastal Division. Duke has a huge question mark at quarterback with starter Sean Renfree suffering a concussion last week at Florida State. The Blue Devils are in good hands whether it be Renfree or Anthony Boone under center. Renfree is more of a pure pocket passer, while Boone is also a threat to run the ball. Both quarterbacks love to find the ACC’s all-time receptions leader Conner Vernon who has 54 catches for 761 yards and five touchdowns. The Blue Devils have three receivers with over 400 yards and rank in the top 20 in the ACC. The Clemson secondary has had issues tackling in open space this season and if those problems occur in Durham, it could be a long night at Wallace Wade. WHY CLEMSON MIGHT WIN: Let’s face it, there aren’t many teams that can keep up with Tajh Boyd, Andre Ellington, Nuk Hopkins, and Sammy Watkins…and Duke won’t be able to either. Florida State put up 48 points against the Blue Devils last week and although FSU has a stout defense, their offense has nowhere near the firepower of the Tigers. In conference games, the Blue Devils are giving up 212 yards per game on the ground and 259 yards per game through the air. That is great news for the Tigers who are averaging 157 yards and 329 in their respective categories. Duke will try to play a cover zero- or man coverage- which will allow the Tigers an opportunity to hit big plays. 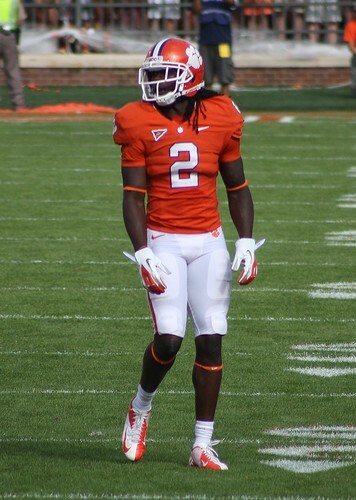 If the Duke’s cornerbacks play up on Clemson wide receivers, Hopkins, Watkins and company will run right past them. If they play off the receivers, Boyd will simply hit the underneath routes and Clemson will go on longer, more sustained drives. The Clemson defense has been much improved over the last two weeks and with increased pressure on the yet to be determined Duke quarterback, the Tigers should be able to limit Vernon’s success downfield. WHAT WILL HAPPEN: Clemson’s defense has been the biggest question mark so far this season, but since the disaster at Florida State, defensive coordinator Brent Venables has watched his guys improve before his eyes. The Tigers’ high-octane offense continues to impress and this weekend will be no exception. Expect Duke to play – man coverage- a style similar to Wake Forest that will allow Boyd and company to breakoff many big plays and get into a groove early. This one may be close in the first 30 minutes, but the Blue Devils just can’t hang with the Tigers.